Whether you're a youth soccer player, a college soccer player, a soccer coach or someone who simply wants to improve their game, you've come to the right place. At Soccer Training Info, you'll discover useful tips and soccer training ideas that will put you on your way to becoming a quality soccer player and a better student of the game. The best part about playing soccer is doing it well and ultimately winning, especially when it’s almost to the degree of embarrassing your opponent with your soccer skill and talent. Whether it’s making a great pass, scoring an incredible goal, dribbling by someone with ease—leaving the defender at a standstill, these are all great achievements and soccer skills that inspire a certain amount of well deserved satisfaction. So, let's learn how to play great soccer. Here, you’ll find a wide range of information to help you become the best soccer player you could imagine yourself to be. 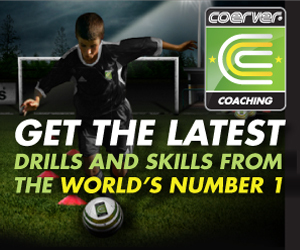 See our Coerver Coaching review and the Coerver Coaching drills section, Cantona's top ten goals, fitness & nutrition guide, and our soccer drills directory. And find out what soccer shoes the top players are wearing and learn how to play like the pros. Want to know who Messi idolized as young player? Look no further than Pablo Aimar. Your Soccer Players, Getting Older & Getting Worse? Not only will this soccer website show you how to train for the game, but we’ll also teach you how to learn from watching games. If you want to watch the best soccer players in the world, browse our soccer videos section. This is the place to be if you want to learn how to play like a champion and play like Lionel Messi. Plus, we’ll show you how to shield the ball, improve your first touch and play the way you're facing. Learn about passing and crossing: the stock ball, passing skills, crossing the ball, two touch soccer, and passing standards. Bookmark us if you want to stay up to date. Whether you want to learn how to go from college to pro soccer, access to the research on what could be the missing fitness component in your soccer training, or to watch a recent video of the Zidane spin move, you’ll find current information here and in our blog. Want to watch soccer at a local pub? Take a look at our new soccer bar listings, the best places to watch the English Premier League, Champions League, or the World Cup. Once you’ve got a firm understanding of the game, the information you find here will bring your soccer training up a notch. Get up to speed with speed training, browse our soccer definitions, learn about plyometrics, goalkeepers improve your vertical leap, and field players get a head start in heading and juggling. Plus, take a look at the top soccer DVDs, from Coerver Coaching's Make Your Move DVD, or Coerver's Online Youth Diploma to the SoccerU series. Want more info? Don’t worry, we have more soccer resources. To get to the next level, scan the soccer tournaments, college soccer, soccer tours and soccer camps pages. For more, take a look at scholarships, soccer DVDs, goalkeepers and defensive tactics. Want to go to a live soccer game and see the best in the world play, buy some soccer tickets. Find a residential soccer camp. Read about Barca's football factory & Man City's style of play. Soccer coaches: Do you need soccer practice plans for your youth soccer team? Whether you're just starting out, or a seasoned soccer coach, you'll see why the Coerver Coaching Session Planner is the best way to create soccer practice plans for your team. The ultimate in drama in a soccer match is the penalty shootout. Five players from each side take their shots on goal to determine whether they win the soccer match or walk away in defeat. At no time other than a penalty kick is a soccer game reduced into a one on one duel. And the ultimate duel takes place in the World Cup. Will the goalkeeper dive and save it or will the player shoot wide or even up and over the goal. In the professional soccer sphere, usually a free kick specialist will step up and take the kick without trying to pull any tricks out of a hat. It’s simply an expert bending the ball into the back of the net, whether that expert is Beckham, Cristiano Ronaldo, Riquelme, Totti, Ronadlinho, Juninho Pernambucano, or Zidane. It’s one or two steps, and purely a duel between the free kick taker and the goalkeeper. Creativity was once thought of as a "magic gift", held only the select few, but it's a “magic gift” everyone has access to in soccer.